Smoke and Carbon Monoxide detectors have saved many lives by giving early warnings. These early warnings have woken homeowners at the early stages of a fire or gas leak. It is especially important to have them near areas where gas leaks and fires are prone to start. This includes installing them near your garage and furnace, in your basement and kitchen and wherever you have gas appliances or fireplaces. Carbon monoxide is a colorless, odorless and poisonous gas. Carbon monoxide is formed when fuels like kerosene, charcoal, oil, coal and wood are inadequately burned. Internal combustion engines such as those in automobiles, portable generators and lawn mowers also produce Carbon Monoxide. Natural gas in the United States does not contain carbon monoxide; however it may be produced if the fuel source is not burned completely. Acute carbon monoxide poisoning presents with flu like symptoms. This includes headache, fatigue, nausea, shortness of breath and dizziness. High levels of carbon monoxide poisoning causes mental confusion, loss of muscular control, vomiting, loss of consciousness and in extreme levels death. 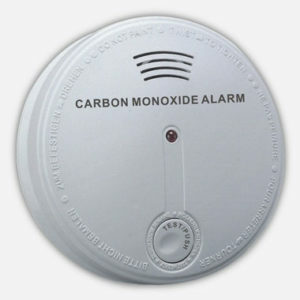 There are detectors on the market that detect both fire and carbon monoxide. You should test your detectors at least once a month using the test button to make sure the alarm sounds. When disposing of detectors return them to the manufacturer as some contain a small amount of a radioactive element. Another must have in your home is a fire-extinguisher. Be sure to get one that is properly classed and Underwriters Laboratory approved. Periodically check the extinguisher gauge to be sure that it is fully charged and ready to be used. Extinguishers should be placed where they can be easily seen or accessed. If you should have to use your extinguisher be sure to replace it immediately with a new one and dispose of the old one according to the manufacturer’s guidelines.